Fabio is our participant from Italy which came to Slovenia, thanks to cooperation with our partner Uniser. In these days he is starting his second month of internship. 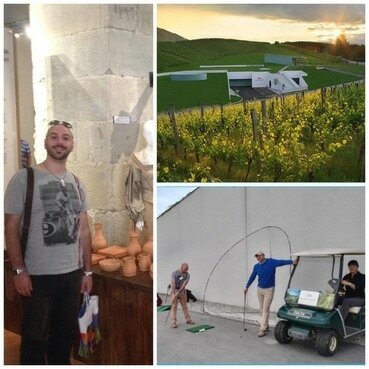 ZNI provided him a work placement in the Product Marketing area in company Zlati grič d.o.o., that focuses on wine producing and also serves as a resort for vacations. Fabio's duties in the company are in the fields of working in all production sites of the company, helping them with marketing issues of the company, web site translation into Italian and English, selling the products in a company shop, etc. Besides the experience in his major, he is also gaining the experience in the wine business – he is learning about wine processing methods and he had also opportunity to speak with visitors from Italy. He showed them the surroundings of the company, presented them the company products and also sold some of them. Fabio is glad to work in a friendly atmosphere, where his co-workers and also his tutor are kind, having been helping him from the first day, to make him feel comfortable in the new environment of the company. During his free time his friends and parents from Italy came to visit him and he was discovering also other places in Slovenia, like Celje, Ptuj or Maribor with them.